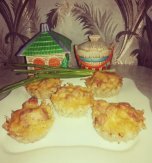 We offer you the recipe of an easy and at the same time delicious appetizer which can be quickly cooked. This starter will be especially appreciated by your children while it is bright and its form reminds little boats. 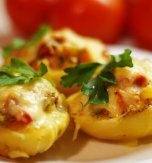 In addition, these crispy potato skins are noncaloric. Scrub potatoes clean, grease them with vegetable oil and place on an oven rack. Bake the potato at 180°C (356°F) for 45-60 minutes. Then cut each potato in half lengthwise and set aside to let the potato cool enough to handle. Peel eschalot, chop and fry it on dairy butter. 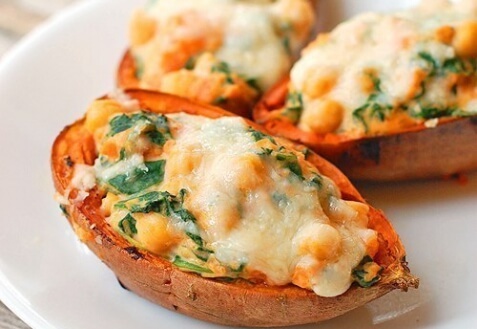 Next add chopped spinach and cook the ingredients 2-3 minutes. Scoop out the potato pulp by the help of a spoon. Add chopped cheese, shredded bryndza, sour cream, the prepared eschalot and spinach. Mix everything thoroughly and then season the stuffing with salt and pepper. 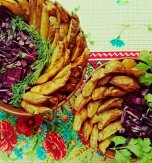 Sprinkle the potato skins with oil, arrange them skin-side down on a baking sheet and place them in an oven for 5 minutes. 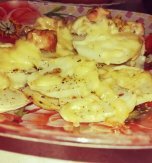 After stuff the potato skins with filling and top with grated cheese. Bake the dish for 10-15 minutes till cheese is bubbling. 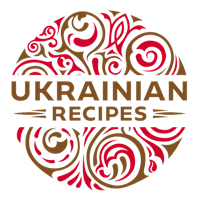 Do you have a favorite Ukrainian recipe for cheesy potato skins? If so, please let us know in the comments below or write us an e-mail.